A luxury apartment complex is coming to Midtown Kansas City, in the former Missouri Gas Energy building, at 3420 Broadway Blvd. Cohen-Esrey Development Group is converting the current structure into 107 one- and two-bedroom luxury units expected to open in the summer of 2020 as Midtown Plaza. Though exact plans have not been finalized, the next phase, tentatively scheduled for completion the following year, will likely entail about 120 additional apartment units, Tim Anderson, a Cohen-Esrey managing director, told Ingram’s. Future additions could include condos and commercial space, such as offices and shops and would call for new construction in addition to the existing development. Midtown Plaza is a big of a strategy shift for Overland Park-based Cohen-Esrey. Over the last several years it has focused on other markets in the Midwest and South, mainly renovating historic buildings into multifamily facilities. 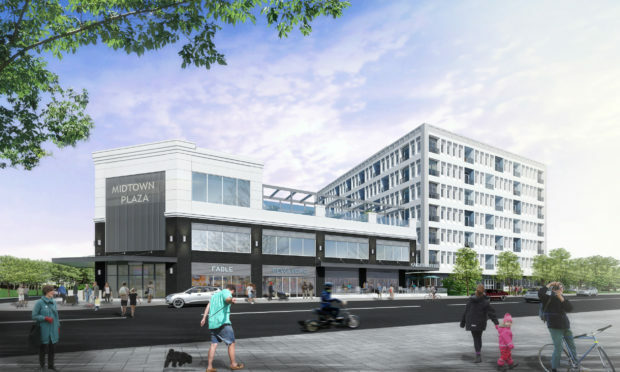 The firm chose the Midtown Plaza site because of the surrounding area’s amenities, easy access to down and the Country Club Plaza, and the future KC Streetcar expansion, which calls for a future stop nearby on Main Street. 3420 Broadway is owned by Kartel Capital, based in Beverly Hills, Calif., which purchased the asset in 2008. City council approved the building’s rezoning back in 2015, and at the time, it was reported that a renovation into a mixed-use complex would cost between $47 million and $57 million.